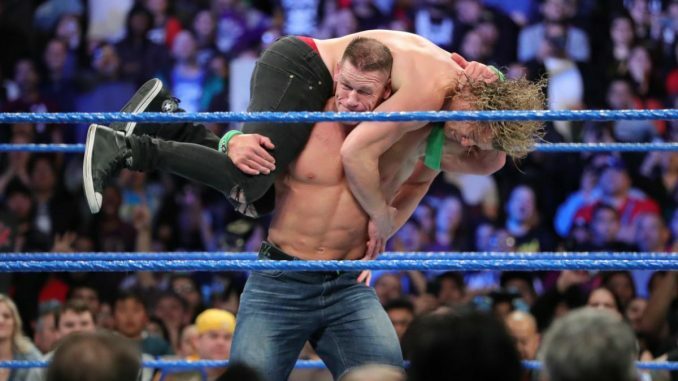 The return of John Cena to SmackDown Live led to the show's highest viewership in 2018, while Monday's episode of Raw experienced a drop from the prior week, despite the appearance of Ronda Rousey and no competition from the Winter Olympics. John Cena’s return to SmackDown Live on Tuesday night led to the show’s second largest number of 2018. This week’s show averaged 2,692,000 viewers on the USA Network, which is the highest since January 2nd when the show did 2,720,000. This week’s show featured Cena appearing in the opening segment and leading to the main event match with AJ Styles and Cena earning a spot in the main event at Fastlane for the WWE title. It would make sense that Cena would be returning to SmackDown next week, although on the WWE’s website they are only advertising Cena for next week’s Raw in Milwaukee. On Monday night, Raw averaged approximately 3,160,000 viewers, which is down 110,000 viewers from the prior week on the USA Network. Given this was Ronda Rousey’s first appearance on Raw, there was no Olympic competition, and the show followed the Elimination Chamber it would be viewed as a minor disappointment that the overall audience was down. The show opened with 3,407,000 viewers and dropped 4.6% in the second hour to 3,249,000 and experienced another drop of 11.2% from the second-to-third hour with 2,884,000 viewers. The show climaxed with the final segment involving Ronda Rousey, Kurt Angle, Triple H, and Stephanie McMahon. Even though the third hour experienced the drop, this was still the highest viewed third hour since the night after the Royal Rumble. CORRECTION: We originally had this week’s SmackDown Live number listed as the show’s highest of 2018, but it was the second highest following the January 2nd episode.